It is from this old (historic) harbour - Byzantine at the time - that crusaders (those who transited through Constantinople) in the 12th century rallied Palestine over sea. The crusader states (Jeruzalem, Tripoli, Antioch, Edessa) being in chronic need of military personnel, constantly small groups of knights accompanied by their servants set off to the ‘Holy Land’ after they had made the personal vow of ‘going on Crusade’ (outside the big centrally organised military operations, that is). The sea route was the shorter and more save way, because large parts of central Anatolia were in Turkish (Seljuk) hands. The maritime ‘charter’ operation was done by Genuese ships. The Republic of Genua had gained (from the Byzantine emperor) trade monopoly in Antalya, in exchange for repairing the city’s walls. An excellent deal for the Italians, as these cost amounted to a lesser part of Genuese benefits. 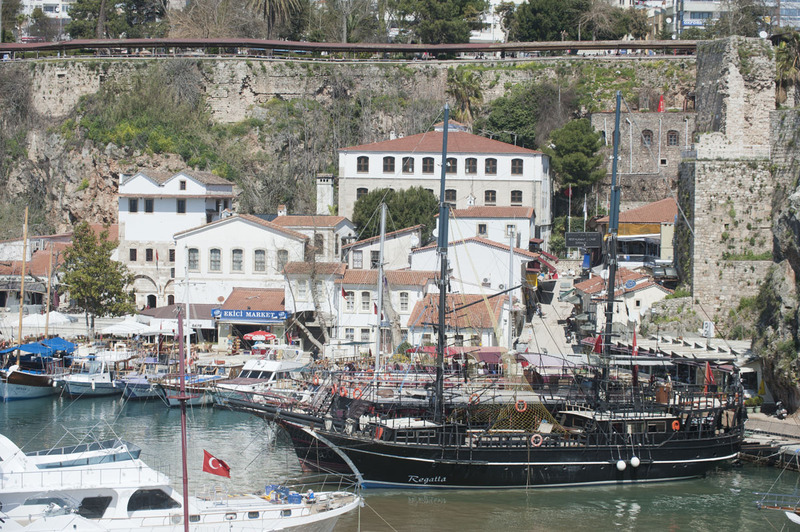 Note that the modern big harbour, called ‘Port Akdeniz’ or ‘Antalya Ticari Limanı’ (= Trade Port), where ferries and cargo ships moor, lies some 8½ km to the southwest of Old Antalya.